Once upon a time, I set out to find the best homemade laundry soap recipe that could be found in the great vast land called the internet. And whadayaknow, a quick google search and I found recipe after recipe where I learned that there really aren’t that many variations. Two, in fact. Two homemade laundry soap recipes. Sure there were some slight variations in the amount of each measured ingredient, but each of these laundry soap recipes gravitated toward 1 of 2 main recipes. And with so very many posts with the same laundry soap recipes out there, I decided instead of trying to reinvent the wheel, it would be smarter to just whip up a batch and test a recipe out to see if they really worked. The savings is just icing on the cake but I needed to be sure it got my families clothes clean. It doesn’t matter how much I save in soap if it doesn’t do a good job. 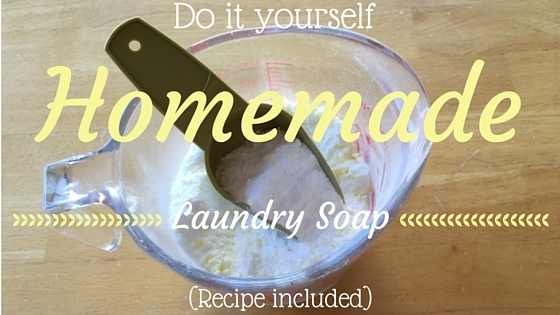 I have always been skeptical about homemade laundry soap, whether liquid or powder. I have read countless articles on making homemade detergent, but I was still skeptical. Then I decided to do the research. The more I read, the more I realized that yes, it would be worth. I decided to do a “smaller” batch and give it a whirl. The verdict: WORTH EVERY PENNY! I am not sure why I was so fearful. It was a tried and true recipe. Before I knew it, I found myself at the checkout line, with all of these crazy ingredients I decided to stick with the powdered laundry soap version as I was lazy and didn’t want to deal with the liquid. The liquid version sounded too complicated (even though I don’t think it is). I just figured with the powder homemade laundry soap recipe , all I had to do was mix everything up; can’t get much easier than that! Note: Use about 2 tablespoons for non-HE and HE washing machines. I am not sure I will ever go back to store-bought laundry soap. Granted, DIY is a way to my heart. I have to say the quality and smell of my newly washed clothes has been worth the process AND WORTH EVERY PENNY! Speaking of laundry, Did you known that you can make your own dryer balls for the price of one bottle of fabric softener but your dryer balls will last for years. Yes, you read that right. YEARS. Follow this step-by-step tutorial to make your own felted dryer balls that can last for many years, and best of all, can easily be scented with essential oils to leave your fabrics soft and smelling fabulous. What’s your favourite Laundry tip? I have wanted to make my own laundry detergent, however, I was thinking it would be time consuming. However, your recipe seems easy to follow. Victoria, The longest part in the entire process was grating the bar soap. Super quick and easy to make and works like a dream. We make a batch of laundry detergent every few months. I feel good about it because I know exactly what is in it and it cleans my clothes well. Now we are even making our own toothpaste! I’ve always wanted to try this! I’ve been enjoying making more and more DIY beauty and cleaning products! Wow! I have never made my own laundry detergent before, but I will be giving it a try! This is something different for a DIY idea. Wow! This is on a whole new level of DIY. Not sure if I am ready for this but I may just give it a whirl and see if I like the results. Thank you. I have never made my own laundry detergent. It seems easy to do though. Maybe I will make it with my children because they would like the adventure of it all. I am really allergic to many laundry detergents. It might be a good idea for me to make some of my own. Then I know exactly what’s in it. This recipe is SO simple, I think I’m actually willing to give it a try! It’s also probably way cheaper than having to buy laundry soap! Well this is great timing – I am doing some fall cleaning next weekend and these tips will absolutely come in handy while saving me time. I wanted to try this, but then my plumber told me that he has had to repair more washing machines due to home made laundry soap then any other reason in the last year. So I haven’t done it… I still want to and keep trying to talk myself into it. That’s interesting… so far I have noticed that my front loading washer is cleaner than it has every been and I use so much less there isn’t any build up at all. I wonder what the issue was? 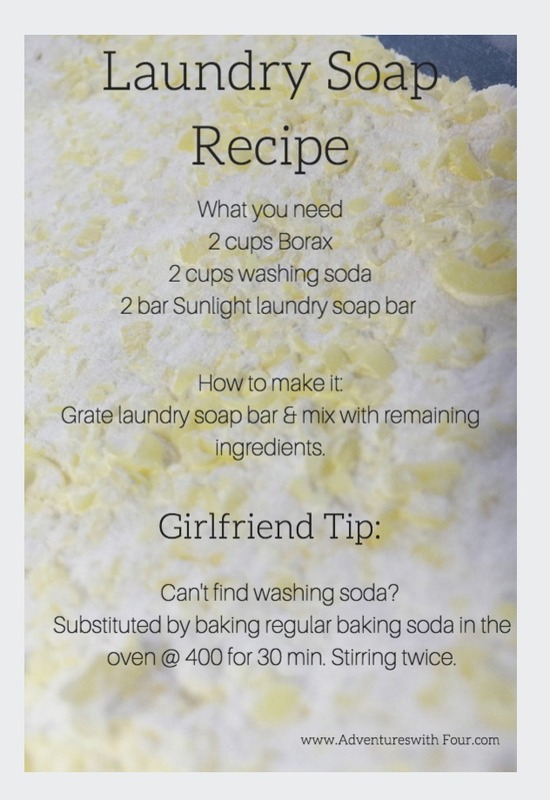 I love DIY Laundry Soap Recipes .. they are less harsh on the skin. I haven’t heard of Borax .. what can I use to replace it? It’s good to know DIY laundry soap is so effective. I’ve been kind of scared to try it too! This makes me want to try it. I’ve been wanting to try to make my own laundry soap for awhile now and have even bought all the ingredients! lol I shied away though because I was concerned about using it in my HE washer. It sounds like your recipe shouldn’t be a problem with an HE machine? Smart to do the small batch first. I am glad it worked out to be worth every penny. This is great! Sometimes I buy detergent and it still doesn’t seem to get the clothes clean enough. I want to do my own. I so need to make this! With 7 of use I am constantly doing laundry, I bet this makes clothes nice and clean but more cost efficient! Wow, I can’t wait to try this out. I love DIY cleaners. How cool. I never thought to make my own laundry detergent. This is one of my favorite money-savers! Great recipe. I didn’t know the baking soda tip, though, so thanks! Oh how clever. I love the idea of being in control of what I do my laundry with. I think I will try this. Works like a charm too Robin. I have already done 5 loads and my whites are whiter. Kicking myself for waiting so long to try it!